The Darrell Russell driver profile DVD is now available! Click here for details. Top Fuel driver Darrell Russell's ascension to the elite ranks of championship contender in the POWERade Drag Racing Series was a testament to hard work, perseverance, and a simple desire to assume his father's role. Although his dad, Burnell, never reached the heights Darrell did - winning six races in 17 final-round appearances and the Rookie of the Year award in three and a half pro seasons - his influence is hard to ignore. The third of four boys, Darrell eschewed the wild world of motocross racing chosen by older brothers Mickey and Ronnie and instead focused his interests on cars, just as his father had done so many years before when he raced street cars. 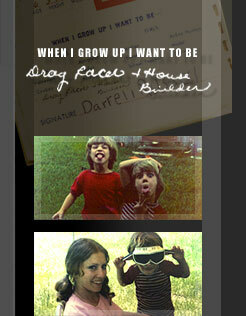 In fact, in his baby album, a 5-year-old Darrell expressed his desire to be a drag racer some day. "I grew up around racing," Darrell said. "Some of my first memories are watching my older brothers race their motorcycles. I also used to love looking at the old photos of my dad when he raced. I always preferred cars and when I turned 15 I mentioned that I wanted to race cars to my dad and he was immediately into it, all excited just like a kid." 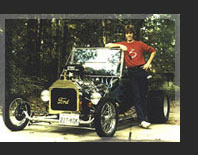 With assistance from his younger brother Chris, Darrell and his father built a 1923 T-Bucket Roadster Street Rod and started racing at local drag strips. For fun each year the trio, along with Darrell's mother Gwen, would head to the Cajun Nationals in nearby Louisiana to see the top professionals in the sport go head-to-head. "The first time I saw and heard a Top Fuel car I knew that was where I needed to be," Darrell said. "Every since that first trip to the Cajun Nationals my life has pretty much been aimed at finding a way to drive a Top Fuel dragster." The first step came in the form of a High School graduation present from his father-enrollment in Frank Hawley's Drag Racing School. "He signed me up to earn my Super Comp license," Darrell said. "Of course, he went with me and then ended up signing up for the class himself. It was so much fun we went back a few months later with Chris and did it again." As soon as they returned to Texas the Russell's went about finding a Super Comp dragster to drive. They found one in Oklahoma and quickly procured the machine. "We didn't know anything about that car," Darrell said. "We just stood there looking at each other wondering what we had gotten ourselves into. That car had so many things on it that we didn't understand but we started racing it anyway and had a great time. We started off at bracket races and then we started running a bunch of divisional races. It was there that I saw the Top Alcohol Dragsters and I knew that would be the next step." Within four years, Russell and family made the move to the Top Alcohol Dragster ranks with a family-owned entry where they spent the next nine years. "It took me three years just to get up to speed," Russell said. "I've always said that anyone who drives a car can drive a race car but it's totally different to drive a race car competitively. "It wasn't until 1994 when things started falling into place for me. That's when I learned how to handle pressure and how to win. All of the drag racing I'd done up to that point was just me learning how to be successful on the racetrack." Once Russell figured out how to win, he did it with great regularity. From 1994-1999 Russell won seven national events (including the 1997 U.S. Nationals), 19 divisional races, and four Div. 4 championships. His brother Chris was recognized as the Crew Chief of the Year in 1996. Then it was time to get serious. Russell's move to the professional ranks is an interesting tale. Due to lack of major funding and the desire to turn professional, the Russell's had taken the 2000 season off and concentrated full-time on finding a sponsor that could take them to the top level of the sport. It was a tough road and the mood in the Russell camp was shaken by the time the season was winding down. "Then, within a few days time I get phone calls from Ron Capps saying that Don "the Snake" Prudhomme wants to meet me and another one from Gary Scelzi saying Joe Amato is retiring and is considering me as his replacement," Darrell said. "I was shocked. First, I met 'Snake' at a race. He's totally cool and we had a real nice weekend just hanging out. No offer was made. They were just getting prepared in case they added another Funny Car. "Then Scelzi calls me and says he had just finished golfing with Joe and had asked him what he was going to do. Joe said he was going to hire a driver and stay on as a team owner. Gary tells him, 'I got the perfect guy for you,' and gives him my driver profile, which was on a CD my brother had made. Gary calls and says, 'Joe's gonna call you. He's on vacation in Hawaii but he's gonna call. Sit tight.'" A few tense days later, offers came from both teams. "In the end, I simply took the job that was right for me," Darrell said. "All of my success came in a dragster and that's where I wanted to be so in the end the decision was easy." Darrell was quick to attribute his success in the sport to his family, the sage advice of the legendary Amato, and the love and stability of his marriage to his High School sweetheart Julie. Darrell spent his time away from racing on his ranch, where he and Julie raise Miniature Donkeys and live with a myriad of other animals.